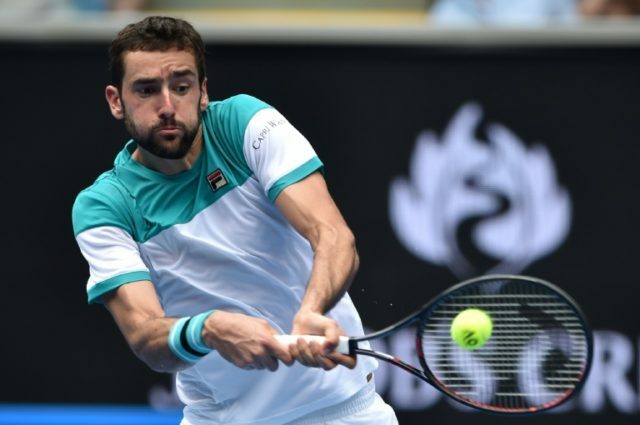 Melbourne (AFP) – Croatia’s Marin Cilic won his 100th Grand Slam match as he mastered Spain’s Pablo Carreno Busta in four sets to reach the quarter-finals of the Australian Open on Sunday. The former US Open champion won the big points in putting away the 10th seed 6-7 (2/7), 6-3, 7-6 (7/0), 7-6 (7/3) in 3hr 27min on Margaret Court Arena. He will face either world No.1 Rafael Nadal or Argentina’s Diego Schwartzman in the quarters on Tuesday. Cilic reached the last eight in Melbourne for the second time and also claimed his 11th Slam quarter-final to equal Goran Ivanisevic’s record for appearances at that stage of the majors by a Croatian man. The Croat won two of the three tiebreak sets and was superior to Carreno Busta in the pressure moments of the round of 16 match. “There were lots of ups and downs and Pablo gave me a lot of trouble in that third set where he was twice a break up and it was difficult mentally,” Cilic said. Cilic served 20 aces, broke serve six times and made a total of 73 winners as well as winning the majority of the long rallies. “That’s my style of play. Pablo is extremely solid from the back of the court and has great shots both on the forehand and backhand and he was serving really good today,” Cilic said. Cilic said he faced a big challenge against either Nadal or Schwartzman in the quarter-finals. “I have played great tennis from the first round against tough opponents and now I am really looking to the next match, it will be definitely be a big challenge,” he said. Carreno Busta reached the semi-finals of last year’s US Open where he lost to Kevin Anderson and also made the quarter-finals at Roland Garros in the same year. He was bidding to reach the quarter-finals in Melbourne for the first time.